In order to conquer the road, you must drive a vehicle that has tools for various situations. For example, during the night, a car needs great lighting that can effectively illuminate the surroundings. The BMW X5 has solutions for night trips, and they're mounted next to its styling grille. In this location, you'll find two LED lights that are powered by adaptive technology. On the road, both lights make a stunning impressions by generating bright, bold beams. The BMW X5 also has other great features that help drivers conquer the road. During a hot day, intense heat can impact the process of reaching a destination. 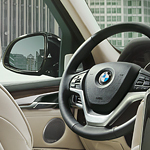 While driving a BMW X5, you don't have to run the air conditioner to cool off. Instead, you can conquer the road and stay comfort by opening the moonroof. This convenient feature can provide fresh air and great views of the surroundings. If you want to take adventures, the BMW X5 is a practical vehicle option. You'll find this automobile for sale at BMW of Birmingham.